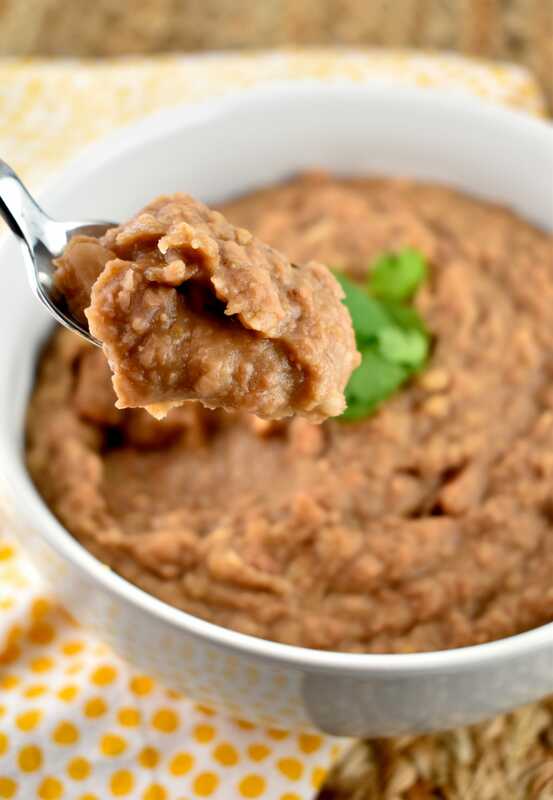 Refried beans are kinda like the mashed potatoes of Mexican food – they make a delicious and filling side dish that is versatile enough to work with most main entrees. They are thick, hearty, and absolutely satisfying. 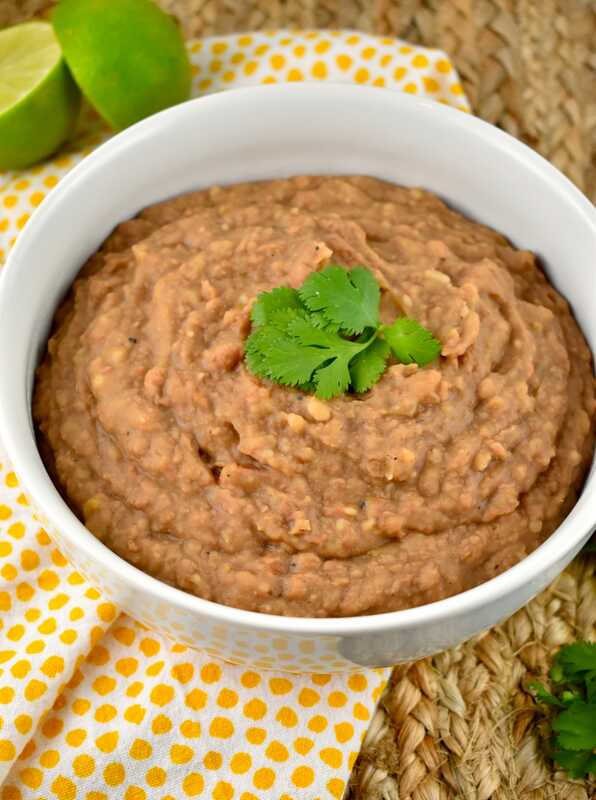 Today, I’m really excited to share my Instant Pot Refried Beans recipe with you all. These beans are so ridiculously flavorful, you’ll never be reaching for the canned beans again! And, I know for a fact that this is the best refried beans recipe you’ll ever have, because it’s adapted from a grandma’s recipe. And we all know that grandmas ALWAYS know best. Amirite? A close friend introduced me to her Grandma Morales’ vegan refried beans recipe, and I was pumped to get in the kitchen and give it a try. While Grandma Morales may have all day to slow cook beans in the kitchen, I don’t. So I decided to adapt her recipe to the Instant Pot, and boy did that work out well! In just a little over and hour, and with very little effort. I made the most delicious, authentic refried beans. EVER. 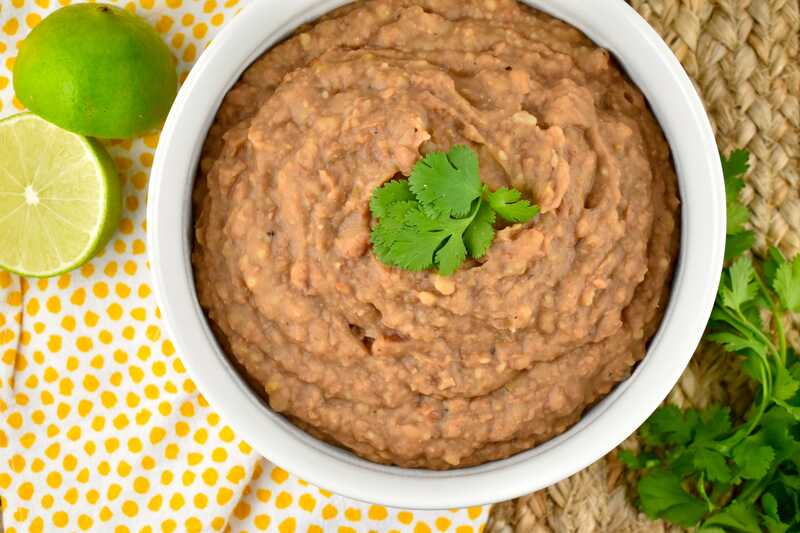 This Instant Pot Refried Beans Recipe makes a nice, large batch, so I was able to not only use it as a side dish, but I kept some in the fridge all week to use for lots of other meals! Want some ideas? The possibilities are plentiful! There is no need to soak the beans beforehand! Who knew?!? I always assumed the beans had to be soaked, but nope. Yay! The texture of the beans is really up to you. You can puree them until they are smooth, creamy, and velvety, or you can just mash them up a bit until they are chunky and lumpy. Anything goes, folks. So how much you mash or puree is all a matter of personal preference. I strongly recommend using an immersion blender for the mashing process. It’s quick, and easy, and allows you to easily adjust the texture to your liking. The amount of water you use will affect the consistency of your beans. And it is totally up to you. Beans a bit too thick, just add more water. 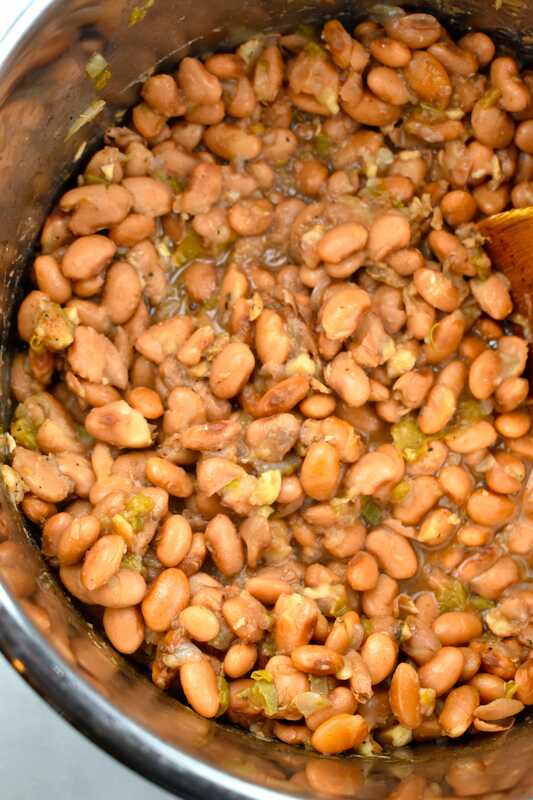 Just make sure to add the water slowly and gradually so that you don’t end up with beans that are too runny. Feel free to add more or less of any of the seasonings to your taste. I’m always a little heavy handed on the garlic because I am a garlic fanatic. But you can totally tweak the ingredients you use based on your own taste preference. Toppings? Yes, please! Naked refried beans are delish, but load them up with cheese, sour cream, chopped onions, and cilantro on top and your taste buds will be thanking you. 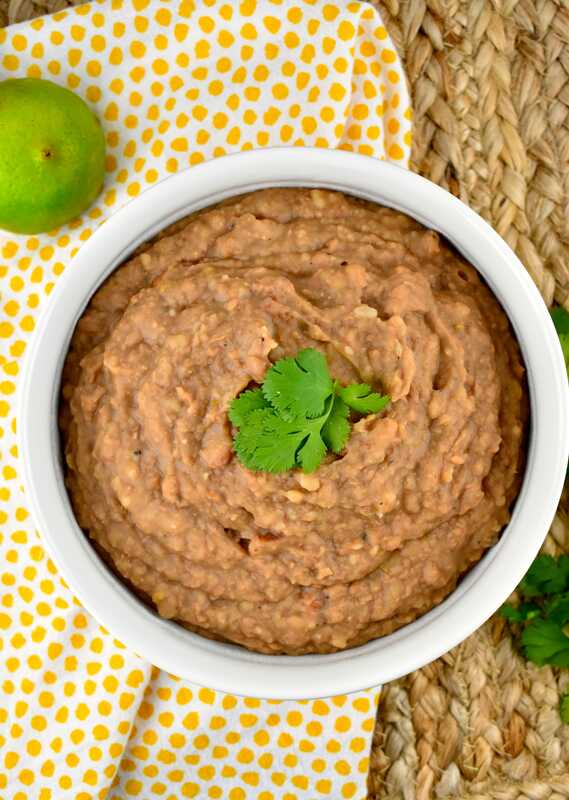 While there may be nothing overly fancy about refried beans, this easy and simple recipe will yield such a bountiful, versatile dish that is going to make your week a lot easier – and much more delicious! WAIT! I’VE GOT MORE BEAN RECIPES TO TRY! 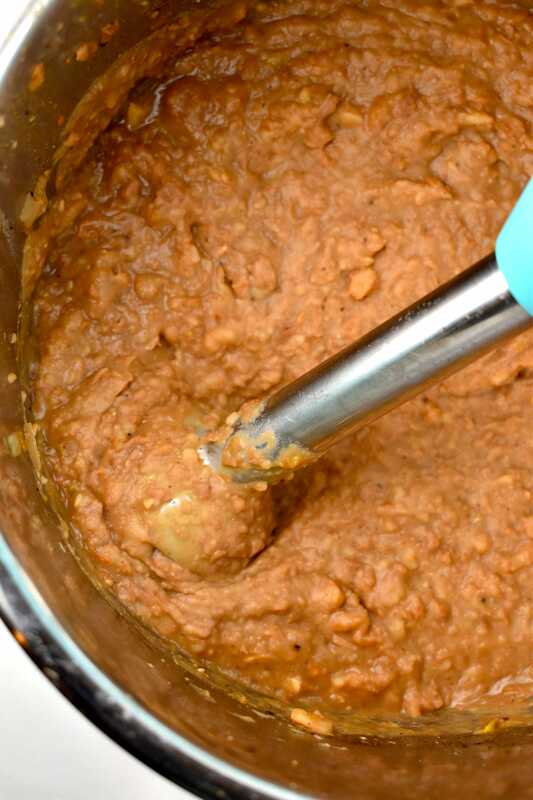 Make your own homemade refried beans from scratch with a quick and easy recipe that brings a popular Mexican side dish to your table in no time. So simple and so flavorful, you’ll never reach for the canned version again! Set Instant Pot to saute function. When pot is hot, add oil, onion, garlic, and jalapenos. Cook, stirring regularly until onions begin to soften, about 2 minutes. Turn Instant Pot off, and add in remaining ingredients. Mix well. Seal pot with the lid, and cook on high pressure for 50 minutes. Allow to naturally release for 15 minutes. Then manually release any remaining pressure. Ladle out about 1 cup of excess liquid and reserve. 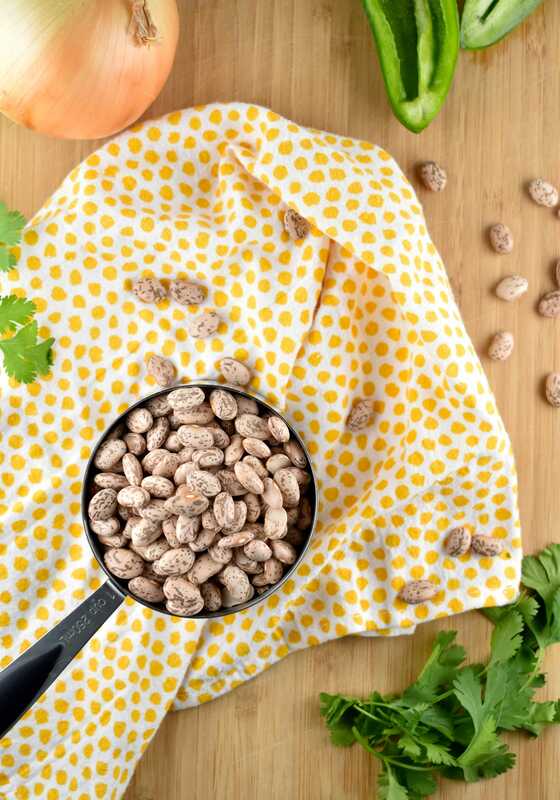 Drain beans into a colander, and discard any remaining liquid. 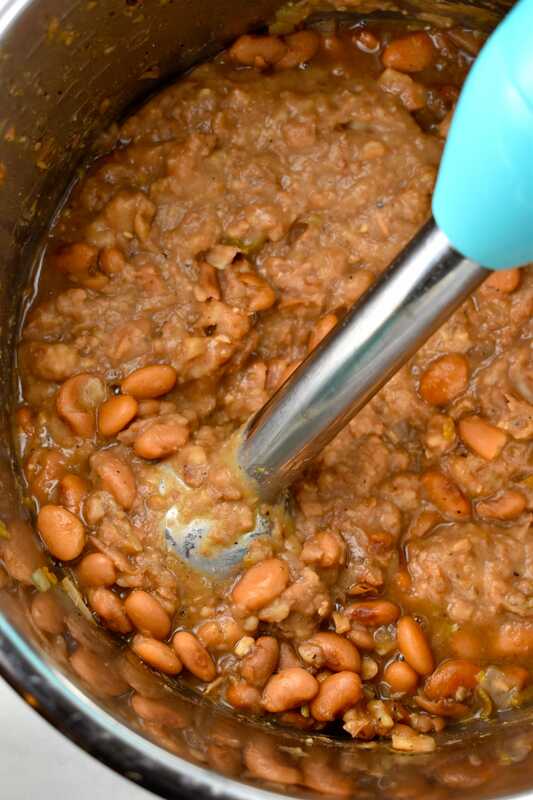 Transfer beans back to Instant Pot, and using an immersion blender, puree beans slowly and gradually adding the reserved cooking liquid until desired consistency is reached. Adjust seasonings to taste. When I enter the nutrition facts into the WW calculator, I’m coming up with 6 points per 3/4 cup? Great question! The nutrition facts include ALL of the ingredients, even the 0 Points ones. So, you have to use the Weight Watchers Recipe Builder and enter the ingredients that way to calculate the Points, not the nutrition label. Do these freeze well? I am the only one in my family that eats refried beans, and I’m afraid they’ll go bad before I eat them all up. Looks like a great recipe! Thank you!